Every painting has a story to tell, a life that it has lived, an energy that it has captured. For me, the experience of immersing myself in the landscape... working on-site every day, until that place becomes the canvas, is a journey filled with excitement, challenges, struggles. It is an adventure of stepping one foot, one brushstroke at a time, into the unknown. This is the process of making something out of nothing, with no camera or 'creative aid' separating me and the subject. It is a pure creative act and each painting, for me, is a kind of artistic-birth. If one of these paintings captures your heart and mind, the way it has for me, I will feel blessed that our paths have crossed... that my journey may become a part of yours. Shown here are the works I have presently available. If you are interested in acquiring a painting, please email me at dustin@dustinneece.com expressing interest and inquiring as to pricing and other relevant details and I will get back to you as soon as possible. Thank you for your interest in my work. 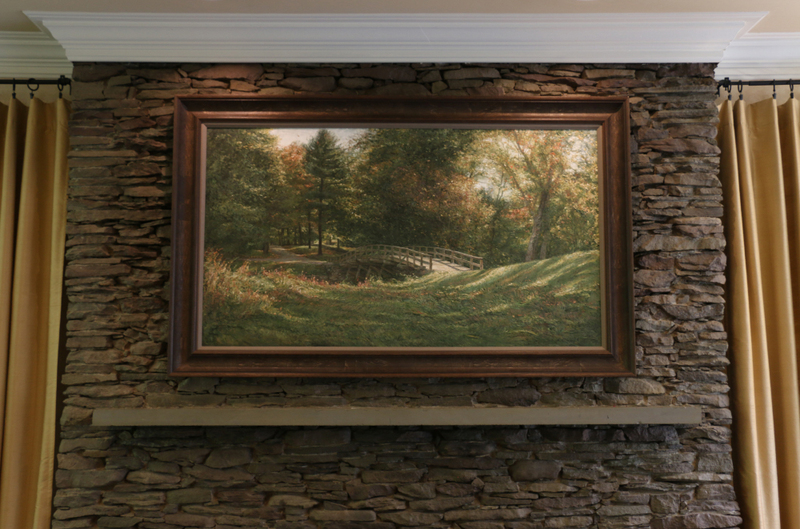 "Bridge of Fire & Light"
oil on herringbone linen, framed. "Bridge of Fire & Light" was two years in the making. Painted in the Fall of 2013 and 2014, it represents victory and independence. It represents that which America stands for: that the freedom, sovereignty, and ultimate responsibility of the individual is a divine principle worth protecting. This is a powerful painting that transports me to a different place, a place of fire & light. oil on herringbone linen, unframed. "The oyster transfigures its grain of irritation by re-clothing it in its own emanations. That which threatened wreck becomes the source of its highest value. It refuses the grain of sand as an irritant and acceptance forces a new product born of hidden resources that glorify its drab life with a precious jewel reflecting heavenly tints." oil on arches oil-primed paper, mounted on birch-ply panel, unframed. The smell of the flowers, the breaking clouds, a path through the field. To me this embodies the time of year when everything bursts forth, comes to life, that crisp intense energy of spring. 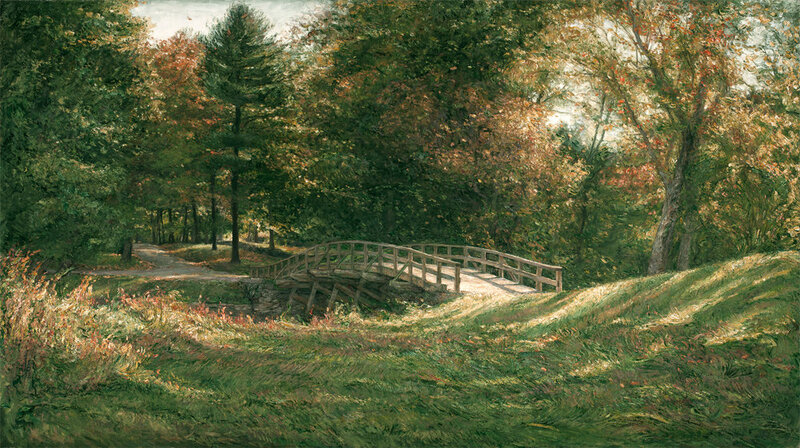 This painting, even in its petite size, feels like a path I can walk. That red ribbon, tied to the white pine (my favorite tree) hanging out over the rippling water of lake Whitehall... is a traditional "prayer flag". It was placed their by a Native American who indicated that that spot was a sacred site. For me it's a symbol of perseverance and the ruggedness of this tree's survival... the roots exposed, this tree stands out against the elements, and asserts itself... to me, a form of beauty unto itself. Sometimes, beauty is sparked in an instant. For me that's a rare occasion, as I usually work on my paintings for weeks or months. This painting came together in an afternoon. A study done with a gathering group of en plein air artists. Energetic, vibrant.